Here's another Credit Crunch Munch recipe. It's a simple 'Spanish Omelette' or Frittata. At this time of year, potatoes don't keep very well, they start sprouting. You can still eat them as long as they haven't gone green, but I seemed to have rather a lot and they needed to be used up before they did turn green or grow leaves! I blanched the potatoes before frying them in a little oil. 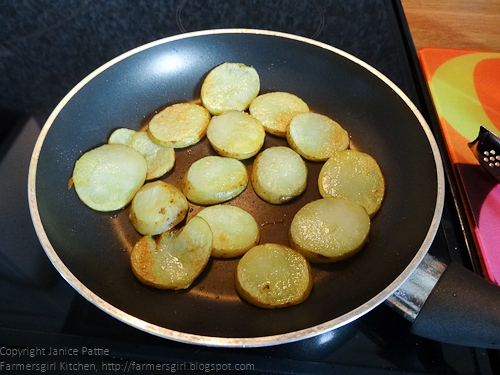 Slice three shallots or 1 small onion, add to the pan with the potatoes and saute until soft. 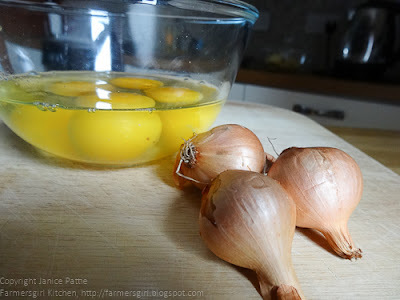 Beat four eggs, add about a tablespoon of water and mix it in, season with salt and pepper. Add to the pan and sprinkle with grated cheese. 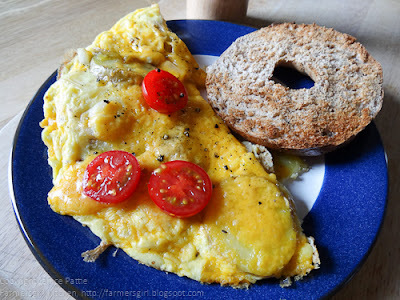 Heat the grill and once the omelette has started to set, add a few sliced cherry tomatoes, pop it under the grill until the cheese has melted and starting to bubble. This served two for lunch. We also had half a toasted bagel each, I'd taken the bagel to work for lunch the day before and then decided to have something else instead, so it needed to be eaten too! you're blog crazy today!... 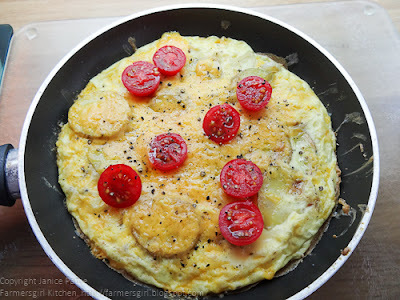 love this omelette.. so simple but so damn tasty! Hello Janice, I love the idea of a Credit Crunch Omelette. 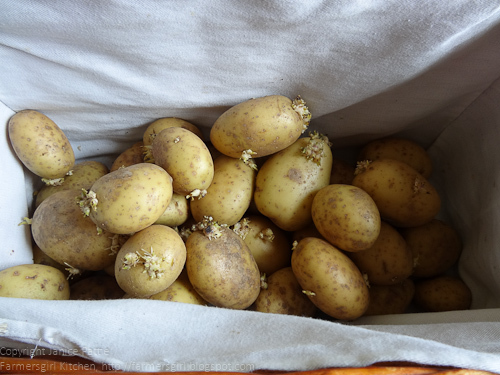 People are often worried about using sprouted potatoes, but as you say, as long as the potatoes are not green they are fine. Strangely enough, I am starting posting some baking from my grandmother's and mother's cookery books....and they certainly will be credit crunch worthy.